Your head does a pretty great job of keeping your brain safe most of the time. Your skull can take a lot of jostling before your thinker suffers damage. But it isn't really designed to take on projectiles or sharp objects or the ground at 45 miles per hour, so over the years we've wrapped up in all sorts of crazy materials in various shapes to try to keep our brains safe. Helmets were arguably the earliest focus of protective wear, and their development dates back to ancient times. Assyrians and Persians created some of the first head protectors, and early models looked like cones or skull caps made of leather and iron. But it was the Greeks who finally gave head gear proper attention. 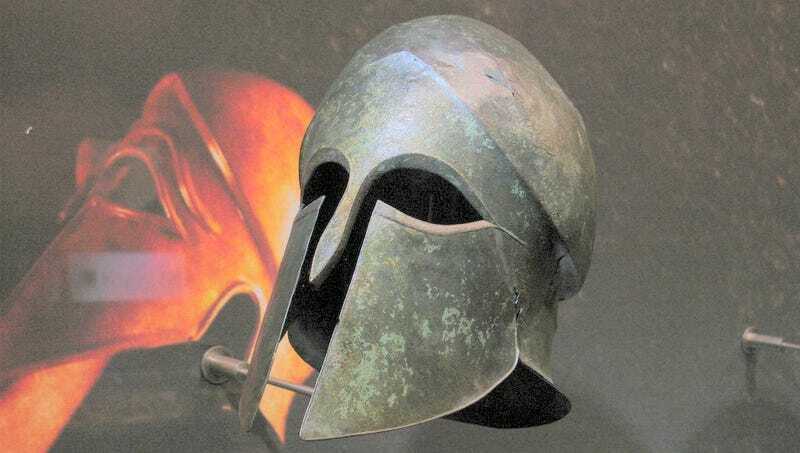 Craftsmen developed bronze helmets that looked more like metal masks, covering almost everything from the shoulders up. Breathing and seeing were (barely) permitted, directed through a small opening in the front of the mask. By the year 1200, people were essentially placing metal cans over their heads: cylindrical with a flat top. Three hundred years later we finally figured out that rounding off the top of a helmet was not only more comfortable, but would let a blow slide off instead of catching the force straight on. Helmets around this time also had hinges so the neck/face/head piece could fit on snugly. Some also had a visor that could be lifted to provide better vision. But then, in the 18th and 19th centuries, helmets kind of disappeared. When firearms started to take the place of weapons like the spear and sword, head armor fell by the wayside. Steel helmets popped up again during WWI (the French, of course, were first to strut the fashion, followed by the British and the Germans), but not first and foremost to protect them from a well-trained gunshot. The metal caps were mainly valued for protection against another kind of war debris: artillery shell fragments—though the rounded caps also deflected glancing bullets. Up until the about this time, helmets were about keeping your head safe from an enemy. But the craftsmanship wouldn't have protected you if you fell. Hard steel, after all, isn't much of a cushion. Around the turn of the century people aimed for something that could keep our heads from cracking during dangerous leisure activities and sports. It wasn't until 1940 that the first professional sports organization decided that head gear might not be such a bad idea. The National Football League embraced safety earlier than most, but it took the National Operating Committee on Standards for Athletic Equipment 30 more years to put rules in place stipulating specific helmet requirements. Today each activity is topped with a helmet tuned to the task at hand. Are you going to bash your head repeatedly into other players and the ground? Then you need something that is engineered to withstand the repeated abuse. For something like a football helmet, Hilgard Muller, Industrial Design Director of Easton Bell-Sports (Bell helmets should, um, ring a bell), explains expanded polypropylene does the trick for chronic battering. "You can repeatedly hit it and it will always return to its original shape," explains Muller. Great for sports, but not for say, bombing down a mountain on your bike. That's because EPP is a little weighty for a sport that prizes lightness. Also: bikers require vents, so more protection must be packed into less space. Expanded polystyrene, which is higher-density than EPP, provides enough structure and cushion for one big impact without having to surround the whole sweaty dome. In fact, trying to get the helmet light and aerodynamic, says Muller, has led to all sorts of innovations in materials that please cyclists without them ever knowing what's baked into their lid. Here's the thing with bike helmets: they need to save your skull when you slam into the pavement at crazy speeds, but they also need to work when you can't get your shoe out of the pedal and you slowly tumble over. Each unfortunate incident requires a unique construction and foam density. If it's too dense, it will feel like hitting bricks if you tip over rather than slam into something at high velocity. "At too high a density, the foam can't crush," says Muller. "You need to design a helmet that can work for both scenarios." The solution, Muller says, is geometry. By constructing the foam in precisely planned shapes, helmet engineers can manipulate how the material will behave. This way, for example, high-density foam can act more like the low-density variety when they want it to. Helmet developers have also taken a tip from traditional construction projects. Like rebar reinforcements in concrete, designers layer in structural reinforcements such as carbon fiber that toughen up helmets. And of course after all that, designers need to make helmets pretty. Because if you can't get people to wear them, the centuries of designing around our noggin do no good at all. The Corinthians did it with broom-like decorations; today it's stripes, and lightening bolts.